Gala and student winners with judges at the Big Island Chocolate Festival. Photo by Kirk Shorte Photography. The 5th Annual Big Island Chocolate Festival hosted at the Hapuna Beach Prince Hotel, themed “Lavalicious-A Chocolate Salute to the 100th Birthday of Hawai’i Volcanoes National Park,” gathered a sold out crowd. In honor of the molten theme, the festival featured booths decorated with sugary lava, chocolate volcanoes, and orchid and faux flames. A team of celebrity judges at competitions during the two-day festival critiqued chefs, chocolatiers, and college students on their products taste, texture, appearance, and creativity. Winning the most culinary awards was Hilton Waikoloa Village, led by Chef Dayne Tanabe for Best Savory and Chef Anna Hohenberger for Best Bonbon. 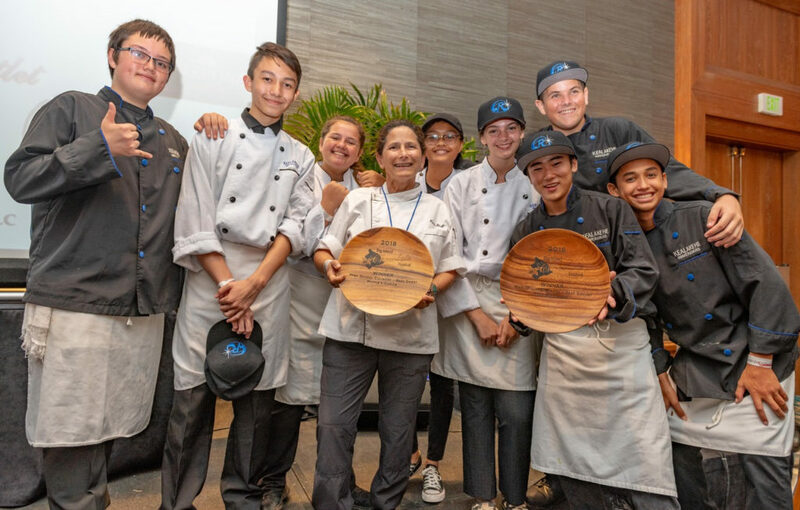 The Hilton team also tied with Four Seasons Resort Hualalai for Best Sweet People’s Choice by Hilton Chef Eddie Enojardo and Hualalai’s Kalani Garcia. 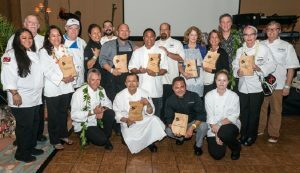 Earning Best Plated Dessert was the Ke‘olu Bake Shop at Hualalai Resort, and Huggo’s took home People’s Choice Savory. Other accolades were won by Madre Chocolate for Best Bean-to-Bar, Nine Fine Mynahs Farm for Best Cacao, and Likao Kula for Best Criollo Bean. The student team of Yi Song and Diana Maciel Hernandez of the University of Hawai‘i-Maui College took first place in the Friday student competition. Jolynn Len and Stella Rainville of Hawai‘i Community College-Palamanui took second place, while third place went to Alicia Alcain and Tomi Salinger of Hawai‘i Community College-Palamanui. Heading the team of chef judges for the two competitions were Donald Wressell of Guittard Chocolate Company, Derek Poirier of Valrohna Chocolate, Elizabeth McDonald of B3 a Beach Bunny Bakery, Ricky DeBoer of The Fairmont, Kea Lani, Steven Arakaki of Kukio Resort, Douglas Paul of Sodexo UH-Maui College, Pam Williams of Ecole Chocolat, Jacques Dahan of Michel Cluizel, Lincoln Carson, Yoshikazu Kizu of Rita Carlton Kapuala, and Krista Garcia of UH-Maui College and Shurilla. 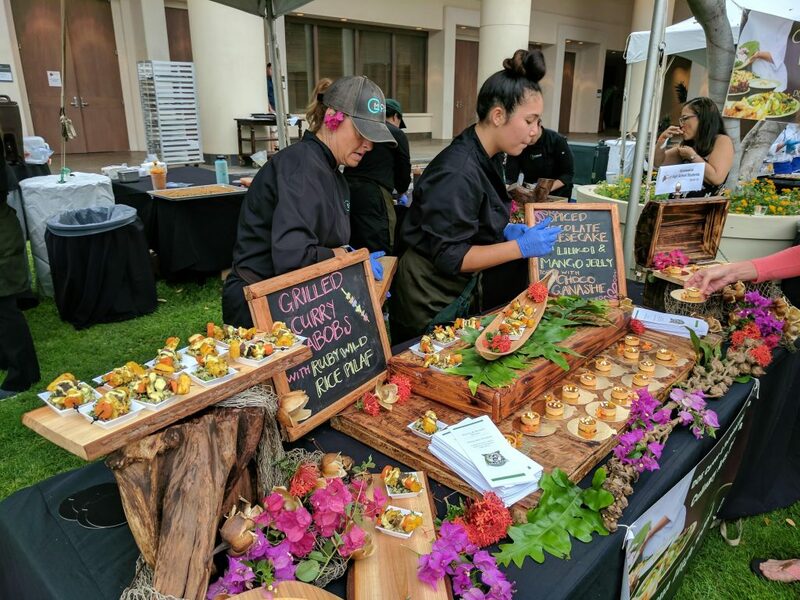 The ACF Kona Kohala Chefs Assn./University of Hawai‘i endowment fund for the culinary program at Hawai‘i Community College-Palamanui and programs at Kona Pacific Public Charter School in Kealakekua are beneficiaries of the festivals proceeds. Each year, the Big Island Chocolate Festival is hosted by the Kona Cacao Association. 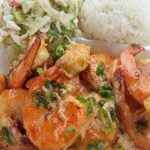 The event places a spotlight on Hawai’i’s cacao industry and those who can create food masterpieces with chocolate.